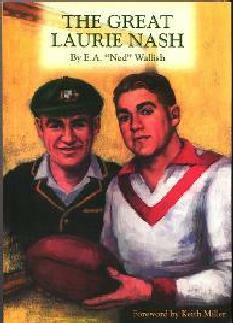 The Great Laurie Nash played Australian Football and Cricket at the highest levels. This book, written by one of Australia's foremost sporting historians, takes us from the early years in Melbourne and Launceston to lakeside South Melbourne and beyond. A true champion and character in this great era of Australian sport, Laurie Nash was never far from controversy and never guilty of false modesty. Adored by teammates and feared by opponents, he was always at odds with the "establishment" whose decisions often denied the sporting public of seeing more of this Australian hero. Although Laurie Nash is a distant memory and figure of history, his life story is now recorded with over fifty photographs and cartoons from the period in this important book.